A small village, Ghosrawan in Bihar is the site where a huge Buddhist Monastery, the Kapotaka Viharaonce existed. This famous monastery was one of the major Buddhist pilgrimage sites in India , also visited by the famous Chinese traveler, Hieun Tsang during his journey to India. The main attraction, especially for Buddhists is a huge Buddha statue in sitting posture that is nearly 10 feet tall. 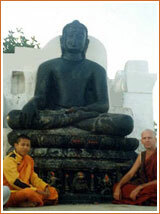 Located on the outskirts beside a lake, the idol of Lord Buddha is carved out of shiny black stone. It presents a splendid sight to tourists visiting the site for the first time. Nearby to the south, is another tiny village called Tetrawan, which also attracts tourists with its Buddhist pilgrimage sites . It has a magnificent collection of statues of the Buddha and Bodhisattvas, all beautifully carved. Nawada : It is a small museum in dilapidated condition, housing a few statues of Lord Buddha thereby depicting Buddhism India. Pawapuri : Pawapuri is a sacred destination for the Jain community. Lord Mahavira, the founder ofJainism died here. The main attraction is the marble temple (Jal Mandir) situated here, in the midst of a beautiful lotus lake. Samosharan is another Jain temple that attracts large number of devotees. Rajgir : It is among the important Buddhist pilgrimage sites in Bihar as Buddha preached many of his sermons, here during Ghosrawan his twelve-year stay. Griddhakuta or Venture's Peak, Venuvana, Sattapani Caves, Jivika, Mango Garden, Karnada Tank and Buddha's sculpture are the prime Buddhist attractions.